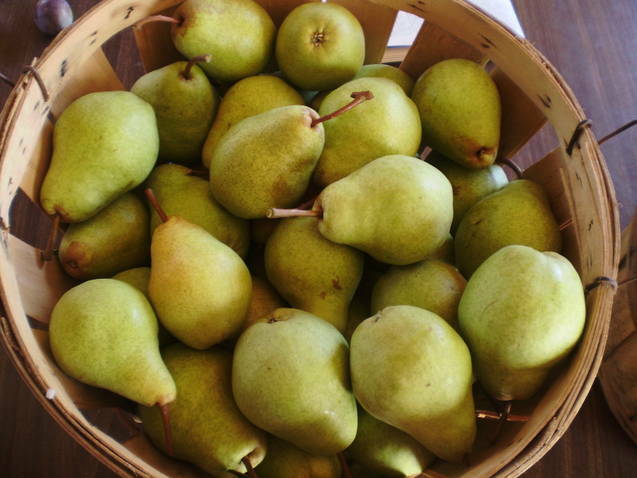 With a Washington pear order in progress right now, we’ d like to share some of our favorite things to do with pears. We really think the best thing to do with pears is to eat them as is, fresh, and dripping with juice. So we like to try to store ours for winter. Later ripening varieties, like D’Anjou and Bosc, are better for storage than Bartlett pears (but we have kept our Bartletts successfully for 4 or 5 weeks in the fridge). You can keep pears the same way you’d store apples, but you need to really watch two things with pears. 1. Make sure they are not ripe at all when they go into storage. Ripe pears just don’t keep well at all. 2. Keep your pears really cold. Apples can be kept cool for a while, basement or garage temperature, and they’ll be okay for several weeks. With pears, you really need to keep them cold. 30° is best. And keep the humidity high. We had an overabundance of pears last year. The dehydrator was running 24/7, and still the pears were ripening faster than we could use them. So although we had never heard of freezing pears, we tried it, and it worked just fine. We don’t like to freeze our fruit with syrup of any kind, so we simply sliced the pears with the peel on and packed them loosely into ziplock bags for smoothies later on. They froze solid as a rock and added an icy sweetness to our winter smoothies. This year, I’d like to try using peeled frozen pears in a crisp. We love dehydrated pears, and there’s nothing to making them IF you have a dehydrator. You might try dehydrating them in your oven if you don’t have a dehydrator, but set it as low as possible, and watch them closely to keep from over-drying. To dehydrate pears, take care to slice them evenly so they all finish at the same time. We like to slice them thick (a little more than ¼ inch) so they come out chewy. Set your dehydrator at about 115 – 120 degrees and dry for about 10 -15 hours. For pear fruit leather, we simply core our pears (peels and all) and whiz them in the blender to make a sauce. You can add cinnamon or ginger if you like. Then spread the pear sauce out onto fruit leather trays and dehydrate for about 10 – 15 hours at 115-120 degrees. Pear sauce is easy to make. Here is our favorite vanilla infused recipe. For pear butter, you basically add sugar and spices, and cook it until it thickens. We’ve made apple butter before, but this year, we’re going to try pear butter too. Here’s the basic recipe we’ll be using for ours. Bartlett pears are the best for canning, or so I’m told. Since we have an order for D’Anjou and Bosc pears going on right now, we’d love to hear from anyone who has experience with canning these. Please leave a comment below if you have some expertise to share.